Wrangell-St.Elias National Park in eastern Alaska is America’s largest national park – 13.2 million acres of unspoiled wilderness. How big is that? The National Park Service illustrates it this way: Yellowstone, Yosemite – and Switzerland – can fit within its borders. With more than 74,000 visitors in 2014, this national park is the fourth-most visited in the state of Alaska. To continue with our countdown of the five most popular national parks in Alaska, let’s find out what else makes this gigantic park stand out! Wrangell-St. Elias National Park is listed as a UNESCO World Heritage Site jointly with Glacier Bay National Park in Alaska, Tatshenshini-Alsek Provincial Park in British Columbia and Kluane National Parks in Yukon Territory. The four parks are noteworthy because they hold some of the world’s largest and most beautiful glaciers. They also offer a range of ecosystem biodiversity – creating prime habitats for plant and animal life that thrive in a variety of environments, including marine, forests, and tundra. The Big Five – bears, wolves, caribou, Dall Sheep and moose – live here. In Wrangell-St. Elias, every river and stream leads to a glacier. The largest glacier in the park – and the largest non-polar piedmont glacier in the world – Malaspina Glacier, which can be seen from space, covers about 1,500 square miles, emptying into the Seward Ice Field within the park. Piedmont glaciers are the kind that starts in steep valleys and end in flat plains, spreading out in a bulbous fan shape. They start out as valley glaciers, like the Worthington Glacier, which neighbors Wrangell-St. Elias. Be sure to get a panorama of the park’s countless glaciers, mountains and forests from the air. The Copper River Valley is the site of some of Alaska’s historic mining towns, including Kennecott, a mill town within park borders that is now a National Historic Landmark. The National Park Service bought many of the town’s important buildings, preserving this fascinating piece of Alaska history. The copper mine operated between 1911 and 1938, becoming a key link in the history of Alaska’s economic growth. The Kennecott Minerals Company built the entire town, including a company general store, hospital, school and other facilities. Talk to a ranger at the Kennecott Visitor Center to get your bearings. 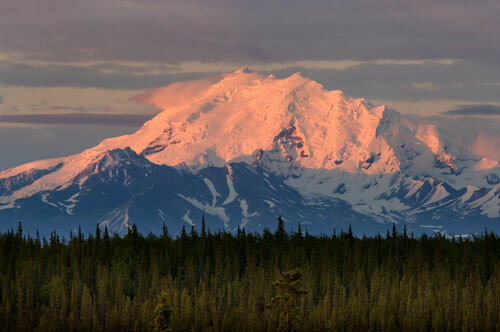 Four mountain ranges meet in this park – the Wrangells, the Chugach, the Saint Elias and the Alaska Range – include 9 of the 16 highest peaks in America. Mt. Wrangell is an active volcano that last erupted in 1900. Wrangell-St. Elias is one of the most pristine wilderness areas in the world. As such, you might not find it as accessible as other national parks, and without many amenities (don’t count on cell phone reception, for example). Only two gravel roads enter the park. Nabesna Road in the northern part of the park leads you to areas where you can hike and camp. McCarthy Road leads to Kennecott National Historic Landmark. There are six visitor centers where you can speak to park rangers, who can update you on wildfires, wildlife, and other information. If you’re looking for an adventure, try a hike of Root Glacier from the Kennecott mine, or try a guided tour like wilderness rafting. The Copper River Princess Wilderness Lodge is located only four miles from the Wrangell-St. Elias visitor’s center, a prime spot for planning all your national park adventuring. Let our tour desk help you plan your day excursions into Wrangell-St. Elias – try flightseeing, rafting, fishing, glacier hiking and more!